On the bands second album We All The Light an Americana spirit meets a world vibe and gets filtered through unique vocal play, string work, rhythms and phrasing creating an awesome full length work. 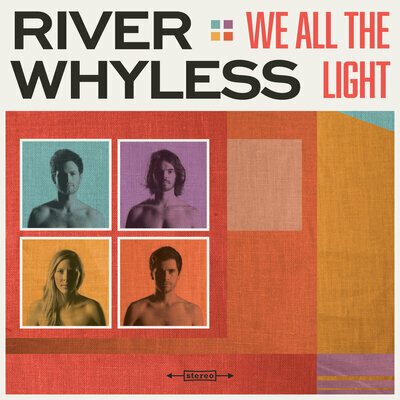 The Asheville based four piece River Whyless (Ryan O'Keefe: vocals, guitar Halli Anderson: vocals, violin Alex McWalters: drums Daniel Shearin: vocals, bass, harmonium) will be making a national name for themselves with this release. Cutting to the chase with the opening lyric of "You can talk to god/In the morning when your sober/You can talk to me/when you're all fucked up tonight" the bands "Baby Brother" takes violins, glowing harmonies and light percussion to announce the groups intentions. "Failing Son" has the rhythm take over but there in lies the strength of the band, even with country influences and soaring harmonies are in the spotlight, it is the rhythm of the tracks that takes the lead in various forms. "All Day All Night" is the best example of this and calls to mind Paul Simon's best work with flashes of West Africa mixed into this Americana string play and singing. Another Asheville based group, Toubab Krewe fused the music of Mali with a jamband direction but here River Whyless take a more pop approach and succeed. "Sail Away" and "Kalangala" continue that melding of world vibes before Anderson takes lead vocals and delivers fluttering affections with the dramatic "Bend Time" the questioning "One For One" and darker "Blood Moon". The dueling of lead vocals over hand claps for "Life Crisis" lead to the disks best story but the one downside to the album is that there isn't a truly standout complete track that ropes the listener in. That said, the music does that trick after just one listen even if the album gives its best songs early. The cover art and the wrapping up of the closing track linking the thematic album give an artistic touch and proof the band are fans of the Talking Heads, but they are still evolving. For now consider them a more mountain version to Vampire Weekends city world music vision, River Whyless makes everyone's ears shine with We All The Light. Dylan Cover #244 The Rhipeters "Maggie's Farm"
Dylan Cover #242 DeFacto "One More Cup Of Coffee"